Winning Secrets to a Successful — and Profitable — Career! How would you like to wake up every morning ready and willing to go to work? IN fact, what if your work was more like play? What if you enjoyed your work day so much that you did not view it as work at all? What if you arose every day knowing that you were going to solve people’s problems and build relationships while doing so? Al of these options are available to you now — in a sales career! Ruth Klein’s book, The Everything Guide to Being a Sales Rep, is a comprehensive how-to on being a successful sales rep — whether you are selling products, services or yourself! 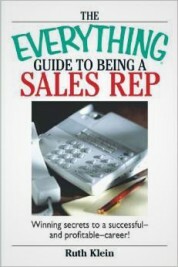 The book includes: Top Ten Things Every Sales Rep Should Know. Chapter 12: Who Are You to Your Customer? PLUS… Helpful hints and information you need to know highlighted in EVERY CHAPTER!